When the Grady Twins said those words at Elstree Studios 35 years ago, they really meant it. 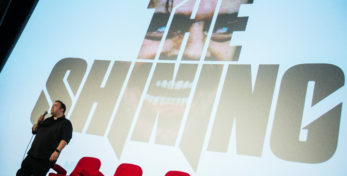 And to prove it, they are returning – by invitation of The Elstree Project – on 23 May 2015 to celebrate the original release of The Shining. Supported by the Kubrick family, Warner Brothers and Elstree Studios, “Forever and Ever: 35 Years of The Shining” will bring back many of the original crew and cast of the film to the very studio where the film was made. Tickets will go on sale later in the year. Join the event page on Facebook to keep up to date with announcements. The Elstree Project is an oral history project, run in partnership between volunteer group Elstree Screen Heritage and the School of Creative Arts at the University of Hertfordshire. Since 2010, over 50 interviews have been recorded with cast, crew and studio staff from the six major studios of Elstree and Borehamwood. Interviewees include actors Brian Blessed, Sir Roger Moore and Simon Pegg, film directors John Hough, Steven Spielberg and Walter Murch, and crew members from The Prisoner, The Avengers, Star Wars, Who Framed Roger Rabbit, The Muppet Show and EastEnders. Staircases to Nowhere, the project’s oral history of The Shining, has been acclaimed as “the greatest film ever made about The Shining” by Movies.com. Videos from the project have been seen by almost one million people. Warner Bros. Entertainment is a global leader in all forms of entertainment and their related businesses across all current and emerging media and platforms. A Time Warner Company, the fully integrated, broad-based Studio is home to one of the most successful collections of brands in the world and stands at the forefront of every aspect of the entertainment industry from feature film, television and home entertainment production and worldwide distribution to Blu-ray and DVD, digital distribution, animation, comic books, video games, product and brand licensing and broadcasting. Elstree Studios has firmly established itself as the No.1 Film and Television Studio in London and the East of England. Not only are major television shows produced at Elstree such as the latest Big Brother for Channel 5, Dancing on Ice for ITV, The Voice and Strictly Come Dancing for BBC but also major feature films such as Sherlock Holmes: A Game of Shadows starring Jude Law and Robert Downey Jnr, Under The Skin starring Scarlett Johansson, The World’s End starring Simon Pegg, World War Z starring Brad Pitt and of course multi award winning The King’s Speech starring Colin Firth, Geoffrey Rush and Helena Bonham Carter. The Studios are also very popular for commercials having recently provided stage space for Stella Artois, Direct Line, Tesco, Gucci, Littlewoods and NatWest to name but a few. Elstree Studios has a range of film and TV studios from 3,000sq ft to 16,000sq ft with the George Lucas stages being one of the tallest in Europe with a height of 50ft. Internationally famous acts such as Robbie Williams, Kylie, Rihanna, Take That, One Direction and many other artists find these stages ideal for their tour rehearsals enabling them to fit a full size stadium stage and lighting grid. Elstree also offers workshops, green screen facilities, extensive production offices, dressing rooms, wardrobe and make up rooms plus 40 onsite media related support services from lighting to post production and special effects. Located just 20 minutes from the heart of London, Elstree Studios is without doubt London’s, and the East of England’s, number one studio for any film or television production, tour rehearsal, promo or corporate event.